One of my favourite features to read are Refinery29's Money Diaries (read them here). I love the unique insight you get into someone's lives, just through their witty notes on spending. So drawing on this fantastic inspiration I've decided to start keeping my own spending diaries! I'm hopeful that someone else would like to be featured eventually - either anonymously or names - but I thought I best start us off. I feel us Brits are often so adverse to talking about money - often to our own disadvantage! I think sharing what you're comfortable with can not only be interesting but also a way to share best tips and insights! So I'm going to trial doing my spending diaries on a weekly basis and see how they go - so please no judgement on how I spend my $$$. 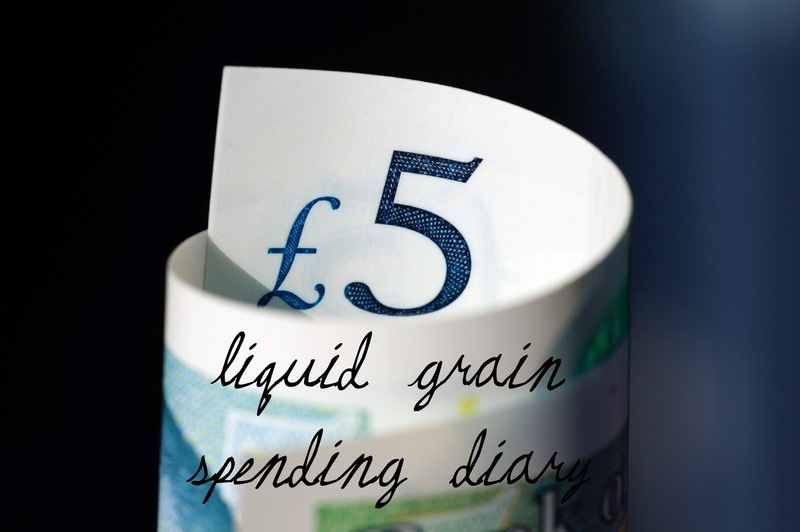 And if you do want to join in and write your own spending diary please email me at liquidgrainofficial@gmail.com or @liquidgrain on social media! Feeling thrifty because there's plenty of leftover slow cooked gammon in the house for me to munch on with broiche buns while I'm working from home (not so fancy brunch). I'm working in Manchester tomorrow so after work I pack up my stuff and get on the road - I need some fuel which costs me £46.12 because I went to the expensive petrol station in my rural town rather than a supermarket one! However, I will be able to claim the miles I use to go to Manchester. Once I arrive in Manchester I discovered that my hotel doesn't have free parking, so that is another £6.40 (which I will also be able to claim back). Deliveroo for dinner - £24 but I can claim £20 back (I was so pleased with myself for ordering a salad I accidentally also got truffle fries which took me over my allowance....). Early breakfast for me, I manage not to over indulge in mini pastries and it's free - double win. At work for 7.45 for an early start in Manchester, and I don't get a break until 2 when I grab some food at a M and S food attached to a petrol station. Overspend massively at £9.90 because I pick a wrap not included in the meal deal and buy two bags of Percy Pigs. After work I drive back up to Scotland - no spending but I do eat a whole bag of pigs. We also get a Chinese take out for dinner but Matty pays! I'm sorting out some life admin and transfer £72 for a friend's hen do next month. Feeling broke already this month but I head to bed after watching The Incredibles on tv. It's the weekend - finally! After a bit of a lie in I go get my nails done at the local salon - £50 for a gel mani and pedi. Then I head to the local bakers - £3.65 for breakfast supplies and a yum yum for later. We are just around the house today, organising things and then we go to the woods to shoot a look and then for a dog walk. My mum needs help on her website Solway Silver so we head around and help in exchange for a roast chicken dinner! Both the dogs need dog food, so we go to Tarff valley for Tilly's food and then Pets At Home for Hetty's (plus some treats) £12.99. Then we go to Tescos to pick up some supplies for the next couple of days (and a pack of creme eggs because I'm addicted) - £15.98. I've taken two days annual leave from work to write a research proposal which is due on Tuesday. It's nice to not be at work but I haven't been as productive as I'd like and I've ate an awful combination of brie, prosciutto and creme eggs all day. On the upside, I've not spent anything! Bring on noon tomorrow - submission time! Today is submission day, so I get up early and power through the last of the proposal and referencing to submit before noon. In an odd twist of fate, I have been trying to clear out things from my wardrobe and actually put them on ebay. Some clothes sold, which gave me £33.61 after eBay and PayPal fees. I'm back at work today, but working from home again. I don't actually spend anything again because there's food in the house and I go to Mum's with the dogs for dinner. So that's the end of my first week of spending diaries, what did you think?